Loc: Ower Yonder, 01.5ºW. 55ºN. Now getting as high as 15º from here and there has been an improvement of definition recently. I can now get it some 2 hours before the meridian but with the big scope’s full aperture still partly blocked by fence & wall structures till an hour or so before culmination. As the higher/co-mounted 3” is not affected by those I have been starting sessions post sunset getting some detailed views with that. Also with the 3” stopped down to 1½” (38mm) with fair detail apparent. My impression re the dust storm aftermath is that perhaps some 60% of the main darker features are about up to 60-70% of their usual intensity. Some like Sinus Sabaeus possibly near normal; but the narrowed Syrtis Major has not yet struck me as particularly dark as I know it can be. The still-low elevation conditions possibly a factor affecting my judgement………. Being so low we see through a considerable column of air and, even if relatively steady and transparent, a larger number of lofted particulates along the path and reducing contrasts are very likely. That is adding another dimension to rating seeing/transparency……….after following planets etc. many times through low skies there is what I have called a crispness factor which seems to improve when they reach >20º-25º altitude seemingly due to those airborne motes not so much taking the contrast-edge off otherwise good conditions……. 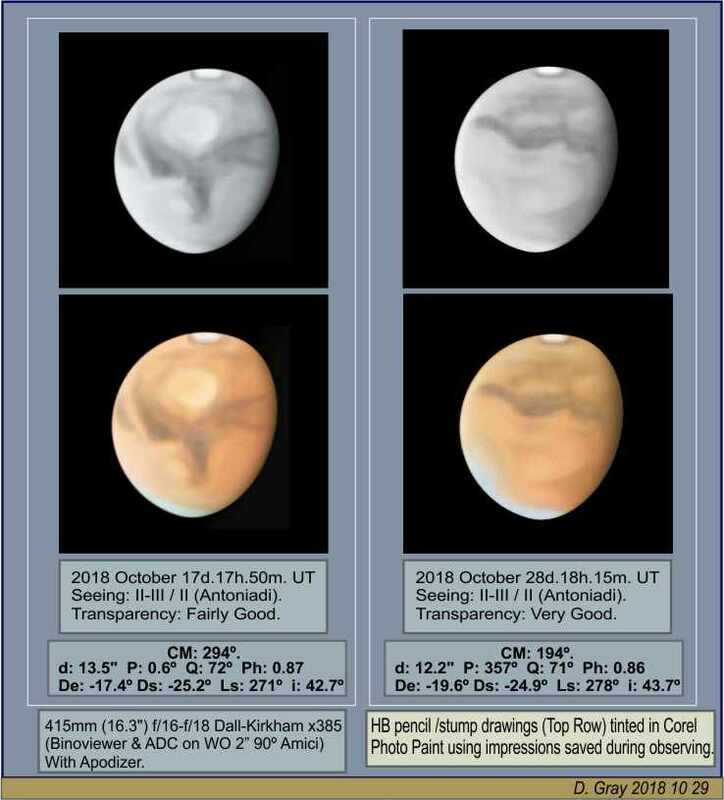 On the attached is firstly a panel of selected views with the 1½” aperture, and from last night the non-masked views with 3” & 16.3” scopes……….all from relatively good conditions. Edited by David Gray, 17 October 2018 - 03:37 AM. Your 3" october 15 sketch does a much better job at showing what i saw than my sketch using the 12"
How do you achieve the smoothness/blending of the markings on the disk? Do you use pencils or a digital drawing program? Excellent results, David. I appreciate the comparison of views in different apertures. This is excellent reference point to which I can compare my observations. 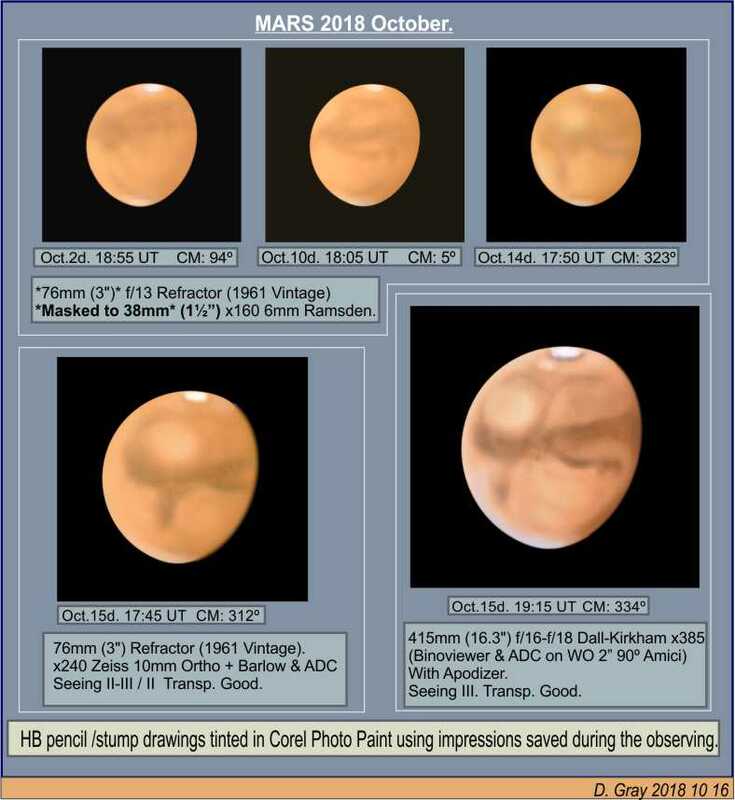 Tonight, I was observing Mars at C.M~325 deg (close to your Oct 14 sketch). 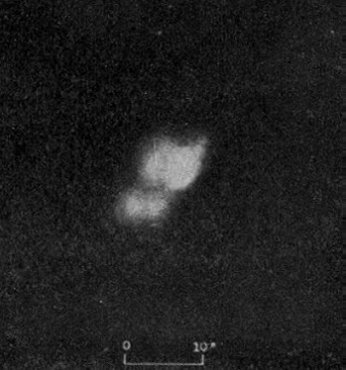 I can confirm that Syrtis Major was much less striking to what I remember from past apparitions. The darkest albedo feature seemed to be in 60mm refractor the rim around southern cap. Hellas was also quite well defined. Thank you for your sketches. They give a good impression what to expect at an instrument of moderate size. The SCP is very distinct. It still melts down, but usually there is always some remaining (in contrast to the NPC). This can be observed easily, and your sketches show how large (or small) the SPC still is. The increasing height above thh horizon helps. Kris: I get those blends from stump-painting the features in broad outline first – that is contrary to the usual practice of drawing them in with the pencil first. This is done by applying a patch of graphite (from HB pencil) and then picking that up on the stump then applied to the drawing area. With this method those kneaded/putty rubbers need avoiding as they leave a residue that happily grabs the graphite off the stump; leaving a mark nigh impossible to remove………. Back in the mid-1990s I graduated to that method rather than pencil-first then stumping and found I at least halved the time of getting a sketch, and virtually completed at the scope. No need to ‘touch it up’ later…..Simply: eliminating the need to stump/blend-out inadvertent pencil marks later if you do not put them there in the first place……! Thus I get the more natural look of the planets etc. there and then and much more quickly than pencil shading. To get the smooth blends I do is simply down to using a fine-texture paper: cartridge paper being unsuitable for the technique; and also mostly abandoning such as Bristol and Ivorex Board. I have been using 100gsm Xerox Colotech inkjet paper (A4); this also resists the dampness of the night air much more than those others. Also it is more scanner-friendly for some reason – tho’ digital camera shots are always preferred. A further technique for very smooth blends (Venus, Uranus etc.) is to firstly rub the blank drawing area all over with a small wad of tissue (Kleenex) paper in tight circles (much as the actual stumping). 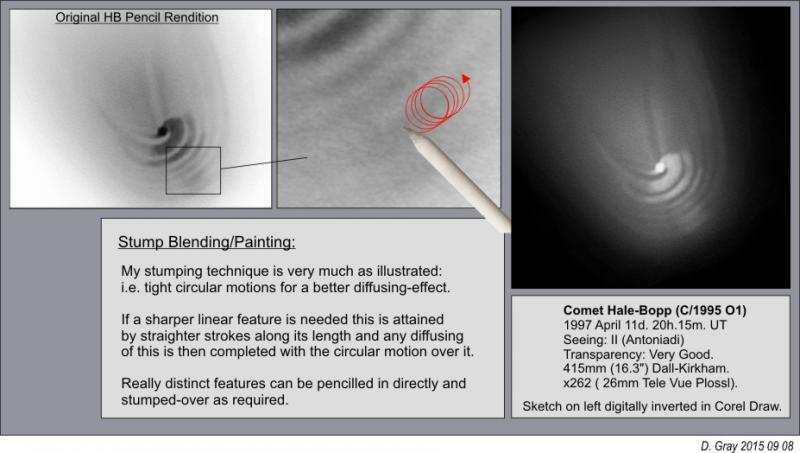 Although I no longer use the inversion method for Comets, DSO and such – the attached demonstration (posted somewhere here before) describes the method as with planets. Edited by David Gray, 17 October 2018 - 08:47 AM. Very fine sketches of Mars Climbs……. . Thanks for the elaborate explanation David! I had a feeling standard printer paper was unsuitable for fine blending… Also the scanning apparatus has a big influence: on the actual paper drawing the blending can be acceptable, but the process of scanning can be so unforgiving and magnifies any ‘roughness’ in the paper making the scanned image very grainy. I then have to smooth it digitally using gaussian blur technique to make it restore the smoothness like on the actual paper drawing again. but alas this also blurs the finer detail and just messes up the sketch! 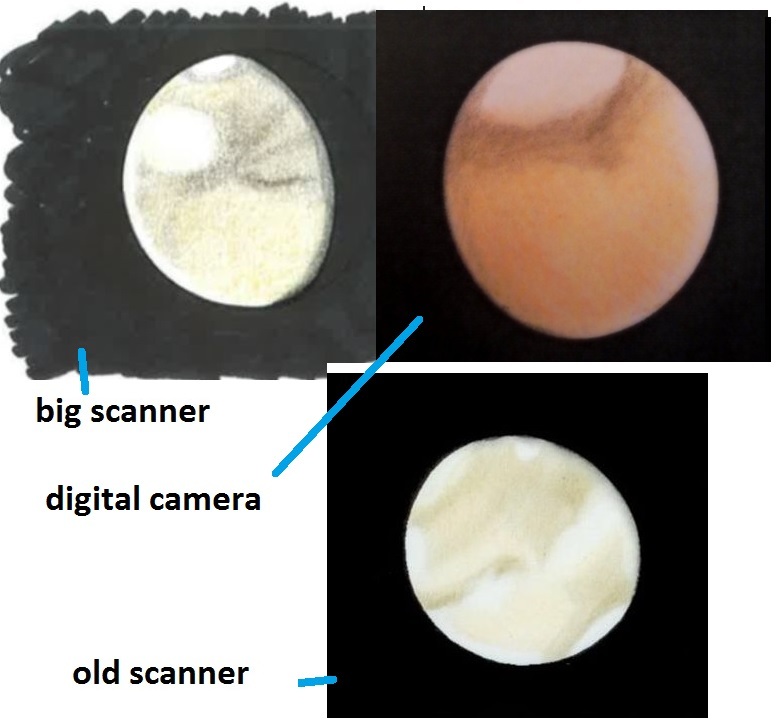 Come to think of it, I didn’t have this issue with my old (broken) home scanner: draw and scan, didn’t need to blur it afterwards, the scan and drawing were very similar. Nowadays I scan sketches using the big scanner/copier/printer at work making it very grainy, and I have a lot of patching up to do, hence why all of my scanned Mars sketches from 2015 onwards look very different from each other in color, contrast and sharpness/smoothness… compared to those of ‘09/’10, ‘11/’12 and ‘13/’14. Kris: It’s the troubles you describe that led me to what I do now. I see nothing wrong using a computer to bring the scan-despoiled sketch back to match the original and in my case Corel Draw has many ways of doing that. Straight forward in theory; but often I found myself spending over an hour (several... ) digitally trying to match the originals that often only took me ten minutes at the scope. Ending up stressed out of my head with a feeling of betraying the old-time principles of messing with the actual sketch itself. Ultimately I decided to mouse-sketch copies, but apart from the time factor (life is too short!) they always looked ‘plastic’ to me. In fact I can go back to the time I had that ‘great’ idea…..see this Link……. Still essentially the same procedure to date; and natural sky (not sun) light works best. I usually take the swivel chair to the best lit part of the room, mount sketch, rotate the chair for best lighting angle and take a few shots from about 8-10 feet and pick the best from those. No messing with scanner settings and all just simply the SD card camera to PC. If hurried to ‘scan’ the sketch when still dark an artist’s daylight bulb in the desk lamp serves pretty well – but natural has proved best. I ended up with using digital camera as well. The problem is with uniform background, as you described David. Especially in case of DSO. Not only you need to take the snapshot at good lighting, not to get some gradients (from my astroimaging days, when one fights with gradients all the time, I learned how to get most of it, using PixInsight). But the paper has to be well preserved as well, which is not the case of my logbook pages. Otherwise one has discrete jumps in background which are very hard to get rid of. Here’s a comparison showing my latest sketch with scanner at work (notice the attempt to lower the grain with blurring, and the bleak, poor colour depth), a recent one using the digital camera (smoother, more colour depth/differences, but overall colours are off, and one from 2008: simply scanned and untouched, very similar to the original, more colour differences and some fine/sharp details while overall quite smooth. It would be nice to get back to those! Summarized, it’s nearly impossible with big scanners to preserve the combo of smoothness + sharply defined borders/details which was originally on paper. Yikes Ive been away too long and missed this. Again Dave, your are fearless in your low altitude forays. This is a snapping assemblege of observations. I truly am glad you are getting improved altitude to work with and persevering despite some obstruction issues. I'll remember this apparition as the Big Bland One. And of all times to throw up a $/&#* global dust storm. On the Hale Bopp *onion rings* - you know I did see them with my 70mm Ranger that cold winter. Not to your resolution level but let me tell you, the little guy put up a very fine little image of that phenomenon. Thanks for the views! outstanding work David, as always, i like that you compared the two scopes as well, nice job! Thanks Pete, Clay & All…. The planet coming good again after some recent vile seeing during the nights twixt getting the two sketches. Also not great weather recently; even a brief blizzard Saturday morn……….! Conditions good enough now to get >500x with climbing Mars but mainly 385x with these offerings. With the lower power the ADC is really helping eking out those more subtle tints - which get somewhat flattened in these lo-res postings. For e.g. an ochrish cast in the south third of the disk might be lost on some screens?? Pete: Hale Bopp really delivered for me back then – lots of beautiful structure…...need to dig out some dozen or so drawings and post sometime – some pencil some pastel. 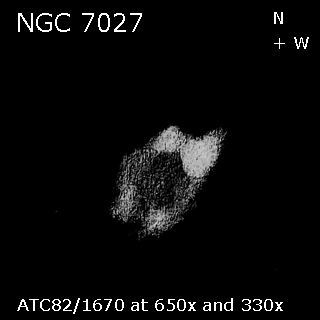 Another bright one would be nice given the additional optics I now have……..20x100s etc. Edited by David Gray, 29 October 2018 - 04:30 PM. Lovely work Dave, you are getting some incredibly subtle tonal variations in the deserts e.g. around the outer edges of Hellas, and through the equator north of Cimmerium. I also notice that you are rating your seeing as Ant II, conditions I have experienced only once these past few months. Are you observing in white light too? I'm thinking your ADC is making a big difference! White light: you mean sketching with?........can't abide red at any level - seems I'm that sensitive! variable mains adapter covers most needs. Yes I'm delighted by that ADC; more than I expected too.......! Very impressive work. Even as Mars falls towards 0 magnitude, it is so bright that I need a polarizing filter to improve contrast and cut down that brightness. You must be thrilled as Mars has climbed in your sky. Dave, no I meant are you observing in integrated light, i.e. without colour filters. Yes good to have Mars clear of the obstructions at last…..
No filters for this type of sketch Chris – I guess I had better make that clearer in future…..Always ensure to state when I do – so should be doing likewise when I don’t! In fact when I’m seeking to render colour as seen in IL I try to avoid prior viewing with filters as that can upset the white-balance as much as using non-white lighting. For e.g. after using say a #25, non-filtered Mars looks almost pure yellow for some time. Tho’ I’ve found I can reset my vision quicker by looking awhile with a #58; but as I say I resist filter-first under normal circumstances.